It’s February in Hollywood and that means awards season. And Trophy Wife is right there in the mix: we’ve been nominated for an INNY! The INNY awards recognize excellence in improvisational theater. The Improvisation News runs these awards, with categories for troupes, theaters, and individuals who advance the improv art form. Past winners include Baby Wants Candy for Best Musical Improv and LA’s own Dave Razowski for Best Improv Coaching. Trophy Wife was been nominated in the Best in Long Form category. Improv News readers can cast their ballots online now. Trophy Wife would like to thank the Improvisation News and its readers. It is an honor to be nominated! 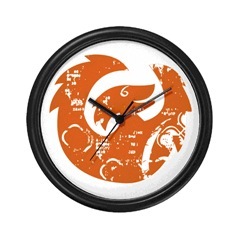 Trophy Wife has again been selected to perform in the annual Phoenix Improv Festival. We will perform on Friday, April 17th in the 7:00 pm show block in the Herberger Theater West. Now in its 8th year, the Phoenix Improv Festival features improvisers from all over the country and attracts a large audience from throughout the Southwest. Trophy Wife has performed at the past two Phoenix festivals. This trip will be our first road trip without Opus. (I don’t mean to get all emotional in a press release, but I really miss that guy). The Festival’s website has complete details, including the schedule of shows. Trophy Wife has been selected to perform in the annual San Francisco Improv Festival. We will perform this Thursday, Friday, and Saturday (July 17 through 19) at 8:00 at the Purple Onion. Now in its 5th year, the San Francisco Improv Festival is a multi-weekend showcase of improv from the Bay Area and from across the country. Our shows will be at the famous Purple Onion. Lenny Bruce, Phyllis Diller, and other comedy greats have played the Purple Onion over the past 50 years. The club is at 150 Columbus Ave in North Beach. The Festival’s site has information on the other featured acts and is now taking online ticket orders. Trophy Wife has again been selected to perform in the annual Phoenix Improv Festival. We will perform on Saturday, April 5th at 9:30 in the Herberger Theater West. Now in its 7th year, the Phoenix Improv Festival features improvisers from all over the country and attracts a large audience from throughout the Southwest. Trophy Wife had a great time at last year’s festival and looks forward to another road trip through the desert. The Festival’s website has information on the other featured acts and will soon be taking online ticket orders. 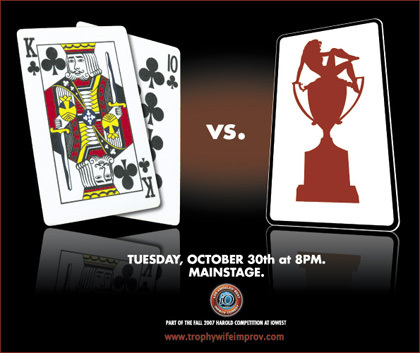 This Tuesday, October 30, Trophy Wife will go up againt King Ten in Round 2 of the IO West Harold Team Competition. King Ten has been a fixture of the IO West Harold scene for many years. They’ve won their share of competitions. They’ve been the object of countless improv crushes. In short, this night of improv competition (Tuesday, October 30 at 8:00) will not disappoint. The only sad part is that, at the end of the hour, you’ll be asked to decide which team did a better show. But don’t worry: the real winner will be you, the audience. Trophy Wife won two Dels last night at the IO West’s first-annual Del Close Awards. Nominated in 3 ensemble categories (Best Team Name, Best Harold Performed, Best Harold Team), Trophy Wife won for Best Team Name and Best Harold Team. The awards ceremony itself was a lavish affair. Craig Cackowski served as the announcer, Josh Dubose as the host, and a cavalcade of IO West’s finest were the presenters. The night celebrated improv as an art form, the IO West as a community, and self-congratulation as an acceptable thing to do on a hot summer night in Los Angeles. As with any awards ceremony, talk inevitably turns to debating who was the best dressed person at the event. I’d like to say that award goes to everyone. The entire theater was dressed to the nines: Miles Stroth in a seersucker suit; Ali Davis in a dress fit for a queen; Nick Armstrong in an outfit that was part P.T. Barnum, part Liberace. Again, I’d like to say that everyone wins Best Dressed, but there is, in fact, a clear and singular winner for Best Dressed: our coach Irene White. Check out Kevin’s photos from the event. For the next three weeks, Trophy Wife will be performing at 10:00 pm on Wednesdays. Our show has been bumped back to accommodate the theater’s Harold competition. If you enjoy a good Harold competition, please come earlier to see the competition shows. The competition is hosted by a rotating crew of Trophy Wives. While we do the hosting, the audience does the voting, so get on down to the most rocking plebiscite in town. And then catch us sharing the 10 o’clock hour with the redoubtable King Ten. Trophy Wife will take its show on the road to perform at the Phoenix Improv Festival on Friday, May 11. Arizonans who know Trophy Wife only through its podcasts now have the opportunity to see the show in person. In its 6th year, the Phoenix Improv Festival showcases improv troupes from across Arizona and America. This year’s festival includes such beloved shows as Bare and Bassprov from Chicago, Cog from Los Angeles, and many more. Shows will take place at the Playhouse on the Park in the VIAD Center. Trophy Wife will perform on Friday, May 11, sharing the 7:00 pm performance slot with Apollo 12, a veteran Phoenix improv troupe. Tickets are available online or at the door. Trophy Wife won the Los Angeles Improv Fest’s Harold competition last night in front of a standing-room-only crowd at the IO West. The final showdown was between Trophy Wife and Hat Trick, another IO West Harold Team. The contest was decided by a combination of audience vote and the votes of a panel of improv experts: Charna Halpern (IO founder) and Stephnie Weir (IO alumna/performer and MadTV cast member). The victory in the finals capped an exhilarating run of four shows in four days for Trophy Wife. On their road to the finals, they faced teams from Los Angeles (Second City L.A. and IO West) and from Phoenix. The competition was generously sponsored by Break.com. Thanks to that sponsorship, Trophy Wife received a trophy, a cash prize, and a framed certificate stating “Break.com congratulates Trophy Wife. This certifies that you are funny.” And Trophy Wife now has a 3-(short)-picture deal to make video clips for the Break.com website. This championship is Trophy Wife’s second. They won the IO West’s in-house Harold Team competition in November. They perform each Wednesday at 9:30 at the IO West.